There were no lack of choices out there when it came to deciding which ESC to use for my SAB Goblin 500 review. Making decisions on quality versus price are often difficult for me, and this one was no different. Another thing that led my decision was the desire to try a flybarless unit with an external governor. Many have told me this helps on all models, but most notably when a model is under powered or batteries are getting weak. 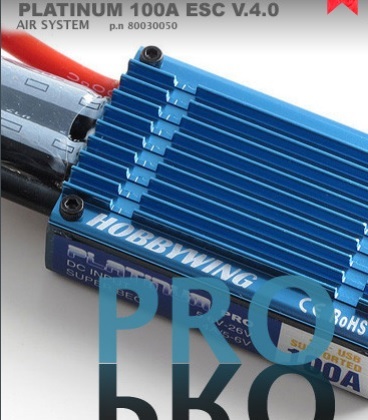 With that desire in mind I decided on the iKon flybarless unit combined with the HobbyWing Platinum PRO 100A ESC. This combination seemed to be fairly potent according to others I spoke with and forum threads. As you would expect most of the ESCs these days install about the same. So to install the HW ESC I first had to begin by putting my EC5 connector. Next I removed the red wire from a 3” extension because I used an external BEC due to the four digital servos that require so much power to operate. You want to be certain to do this because you can cause your BEC or ESC to fail if you leave the red wire connected. The Professional Program Box sure made the setup of the ESC a breeze. All you need to do is connect the ESC to the program box and power it with a 4.8V battery. After programming the ESC I set the throttle endpoints. Then I went back in the ESC to program it into governor mode. I wanted to try the internal governor in the HW ESC to compare that to using the external governor feature on the iKon. So with that soldered the two wires coming from the RPM Sensor to two of the motor wires coming from the ESC. The plug that comes on the RPM sensor is a standard servo plug. Unfortunately the iKon uses a Spektrum style plug, so I just made an adapter that went from a female servo plug to a male Spektrum plug. With the setup I used on the Goblin 500 I knew that it would not be lacking in power. The Quantum 4120-1200KV motor combined with the Pulse Ultra 6s 4500mah 45C battery pack and the HW Platinum PRO 100A ESC was a power system designed for high headspeed and hard 3D flight. Using the 1200KV motor combined with the original gear ratio that came with the Goblin 500, the system was really optimized for the high headspeed flight. The HW governor did a really good job holding the desired 2700 rpm headspeed. Almost anyone would be more than happy with the performance. When dropping the headspeed down to 2450 rpm there was a noticeable change in rpm under hard maneuvers. There are two things working against the internal governor at that point. The gearing is just not optimized at that rpm. So it really has a lack of power to work with. The governor is trying to react to the change is rpm. So it is always a little behind. With that said I believe that any beginner to intermediate pilot would be very happy with this setup. So if you are setting up a helicopter and not planning on running an extreme headspeed range without changing your pinion, then the internal HW governor will do just fine. An external governor has one huge advantage over an internal governor. It knows when there is going to be a load on the power system before the ESC and motor. With this information it can begin applying power to the system prior to the load being felt. Imagine you are driving your truck pulling a trailer and you are approaching a steep grade. What you find yourself doing is speeding up and possibly downshifting prior to engaging the hill. This allows you to get the engine in its powerband and maintain your speed. This is how the external governor works. You can indepently feed in power with each cyclic, collective or pirouetting control. Although this does normally take some tweaking and tuning, the results are well worth the trouble. This allows you to be able to run a much lower headspeed than your power system is tuned for. Please understand it will still not be optimized at that headspeed so you will need to watch your temperatures on your ESC due to the extreme switching that will take place to get the lower headspeed. Currently I am running my HW ESC with the iKon in this mode. I am using the slow spool up setting in the ESC which is really nice. It isn’t too slow, but not so fast that you have to worry about the helicopter spinning while spooling up on pavement. 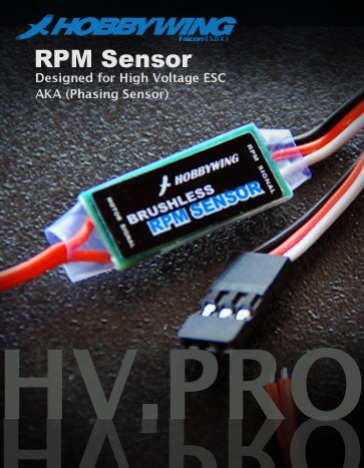 After that the ESC is being fed by the iKon through the HobbyWing RPM Sensor. The Platinum PRO does a fantastic job of delivering the power to the motor. One of the things that has impressed me the most with this ESC is the low temperature it is able to maintain despite the fact that at times I am running it at very low throttle settings. HobbyWing has put together a great combination of these three items that I am certain to use on future projects. 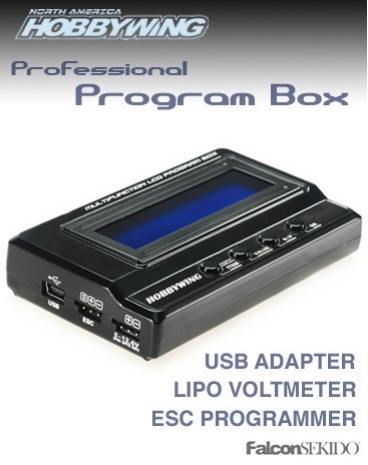 The Professional Program Box also works great at checking the voltages of my lipo batteries all the way up to 8s. For those of you that have surface vehicles like I do, you will also be happy to hear that it works with all of those ESCs as well. So through that program box you will be able to change all of the settings, as well as update software using the program box hooked up to your computer.Below are the features and specifications to the three HobbyWing items discussed. 2.3 BEC: Switching mode DC-DC regulator. 3A@5.25V or 3A@6V switchable by user programming. 1.3 Works as a Lipo battery voltmeter to measure the voltage of the whole battery pack and each cell.